June 5-7 2005 - We decided to take a trip up to Edinburgh for a few days, to take a break and do some sight-seeing. 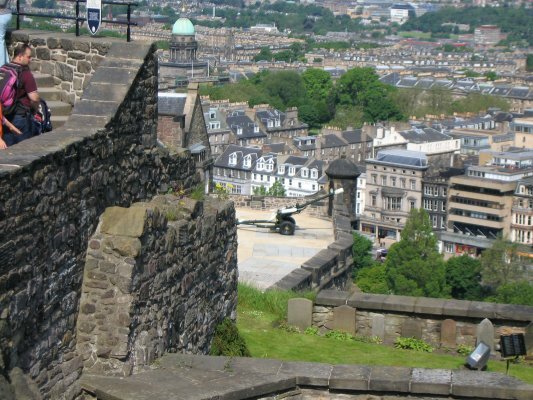 We got a terrific rate on EasyJet and both of us flew from Stansted to Edinburgh for the same price as a single train ticket (and we bought our tickets less than a month before the trip). We got there much faster than we would have if we'd taken the train, though we still had to leave pretty early in the day. 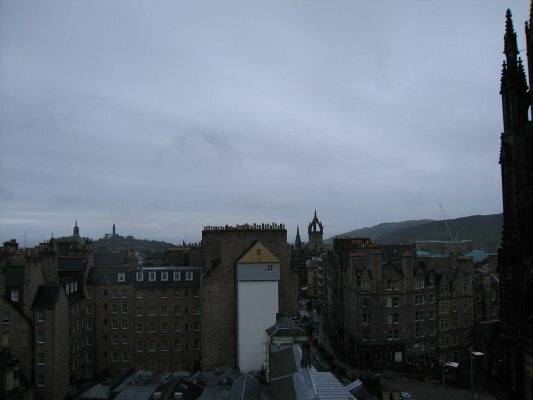 We were in Edinburgh by a bit after 10 o'clock, after taking the airport bus into the city. 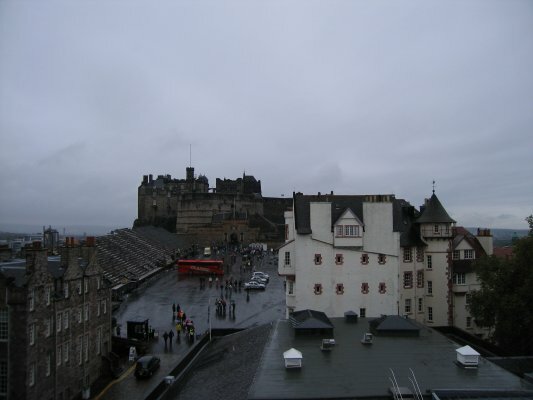 It was drizzling when we got to Edinburgh, but we'd expected it so we weren't too bothered. We were certainly surprised to have two days of blue sky and sunshine after that day! We had a list of things we definitely wanted to do, but we were pretty flexible, so the plans adjusted accordingly. The first day we we visited the Camera Obscura, which is a victorian tourist attraction (set up by an optician) that uses mirrors and lenses to project an image from outside into the tower and onto a screen... the museum also includes the World of Illusions, made up of lots of optical illusions, holograms, stereoscopes, 3d pictures (...it was a lot of fun!) 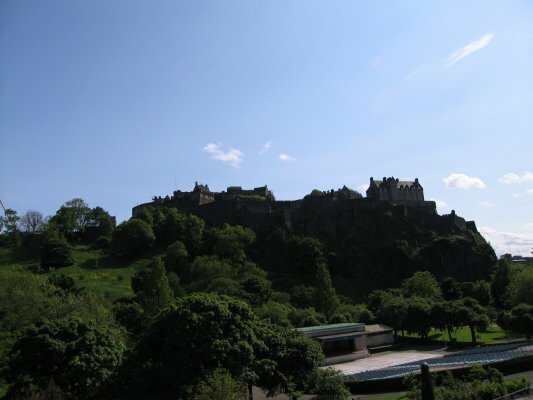 for great views over the castle and the city, then ate lunch in a nice wood and brass pub, and walked around town before catching a bus to our hotel. We walked around a bit more in town that evening, had tasty Mexican food for dinner (see below) and visited Mary King's Close(http://www.realmarykingsclose.com/), a 17th century close (a really narrow, steep street lined with houses between buildings) that was used as the foundation for the current City Chambers. It is well preserved and has recently been reopened to the public, complete with guides in period clothing and rumors of ghosts. Thankfully it was interesting and not too much of a 'ghosty' tour (there are plenty of those to choose from... we just weren't interested). Monday we took a bus out to the Edinburgh Crystal Factory and learned about their glassmaking. Unfortunately they are in the process of moving closer to Edinburgh (they're currenly in Penicuik, about 8 miles south) so we couldn't see live glass blowing, but there were engravers. Next we visited the Scottish Whisky Heritage Centre (http://www.whisky-heritage.co.uk/) and learned all about the making, blending, and appreciating of whisky before we sampled various types. 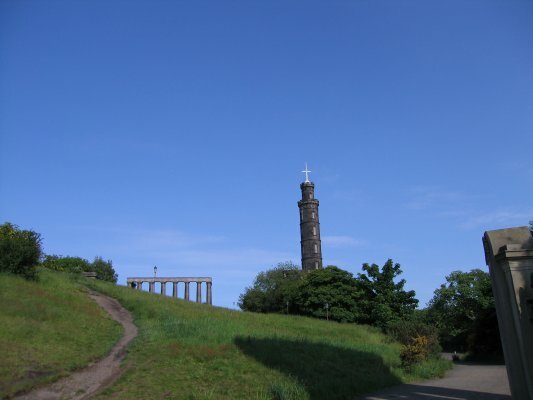 We walked down the royal mile to check out the new Scottish Parliment building (popsicle sticks, tin foil, and grade school art class... but that's just my opinion, of the building anyway) and we climbed Calton Hill to the 'Parthenon' and the (Horatio Lord) Nelson Monument. For dinner we had oysters and mussels at the fancy Cafe Royal Oyster Bar then walked around a bit more. We had coffee at the Elephant Cafe, famous for its collection of elephant decorations and because JK Rowling wrote some of Harry Potter there. 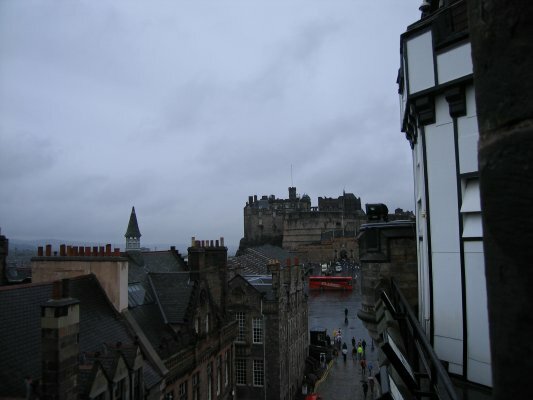 Tuesday we started with Edinburgh Castle. We'd hoped it would be a bit less crowded on a week day, but that really wasn't the case. Paul was a bit disappointed that there wasn't more medieval stuff in the city and castle (it's Neo-Classical town), but we did see St Margaret's Chapel, which is from the 12th century and is the oldest part of the castle and city. We also saw the Scottish Crown Jewels (rediscovered by Sir Walter Scott... isn't that a great story?!) We walked to the other end of the Royal Mile, towards Holyrood Palace (the Queen's official residence in Scotland) and Abbey, stopping at the Plaisir de Chocolat tea room for a chocolate overload on the way. We really just wanted to see the abbey, not the Queen's furniture, and were a bit fed up with admission fees at this stage, so we just looked through the bars then walked back towards the other end of town. We visited the Royal Museum of Scotland (which is victorian and well laid out) and the Museum of Scotland (which is modern and has no real clear layout). 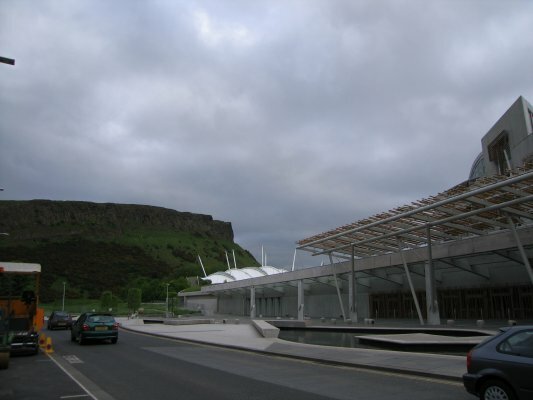 We saw exhibits ranging from prehistoric to Roman to Viking to early modern Scotland. Somehow though, they skipped over the Northumbrian rule of Scotland (more like Paul's time period). Whoever set up the museum didn't seem to like Anglo-Saxons (Bede was Anglo-Saxon); Paul was a bit disappointed. We had lunch in the park then caught the bus back to the airport for our departure. We stayed at a nice bed and breakfast hotel in Newington, just over a mile from the center of town. It was quiet and we even had a tv to watch in the evening. We ate a lot of tasty food and tried various whiskies (it's whisky, not whiskey, in Scotland). Believe it or not, there are no less than 14 Mexican restaurants in the Edinburgh yellow pages (just for comparison: there are 3 in London and two just opened this year)! We looked it up after passing about five on the street...we tried Pancho Villa's and it was the best we've had so far in the UK. We did limit our Mexican meals to one dinner. We also ate Scottish pub food (with Scottish ale, of course), seafood at a victorian oyster bar, sandwiches in a park, and of course eggs, bacon, sausage and the whole bit for breakfast in our hotel. Not sure we'll need to eat much this week! 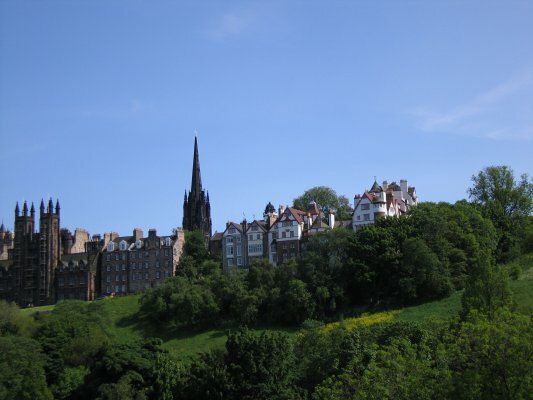 Edinburgh is a really great city. The people are quite friendly (the bus driver checked to make sure we knew where we were going and a kid on the bus offered to walk us to the crystal factory, since he was going by it anyway), there is always alot going on (and we weren't even there during festival season), and it is pretty cosmopolitan. The city is very neo-classical; there are 'temples', obelisks and monuments everywhere. There are several huge, impressive cemetaries (another reason for all the ghost tours), but there are many more of the living than the dead in the city. 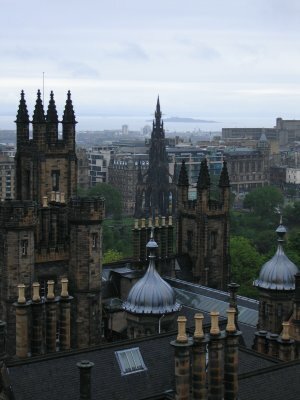 From the roof of the Camera Obscura, we were able to get views over Edinburgh. 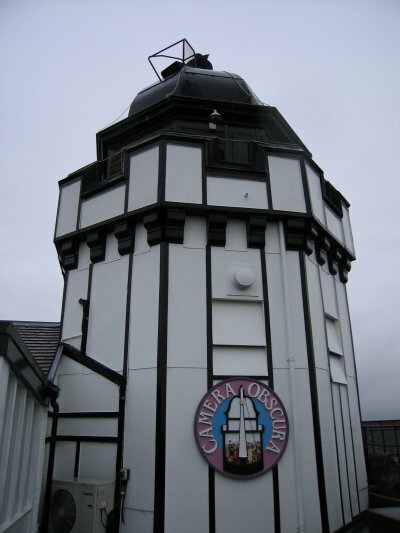 The first photo is of the camera obscura itself. The mirrors and lenses project the image from the top of this tower onto a screen below. 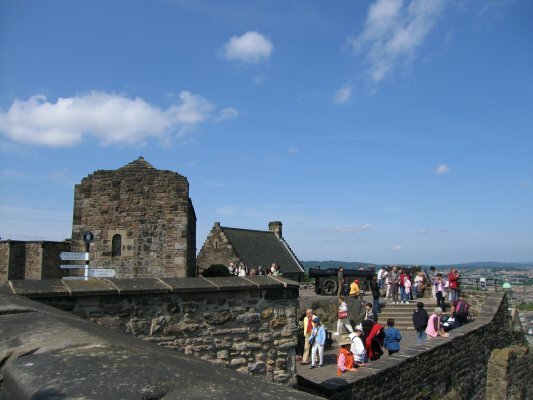 The next two pictures are looking towards the entrance to the castle. 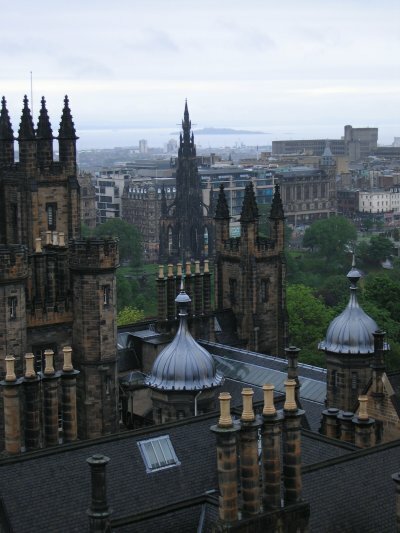 In the third picture you can see the spire of St Giles church. 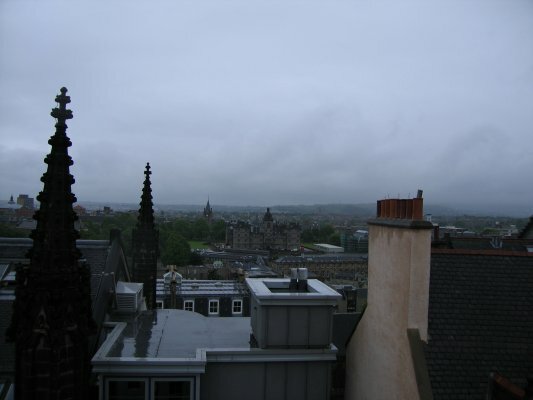 These are a few more pictures from the roof of the Camera Obscura. The first picture is the Whisky Heritage Center (Centre), which is housed in an old school building. The big, fancy building in the next picture is the Heriot School, which was originally a school for orphans donated by a great philanthropist. It is now an exclusive preparatory school. 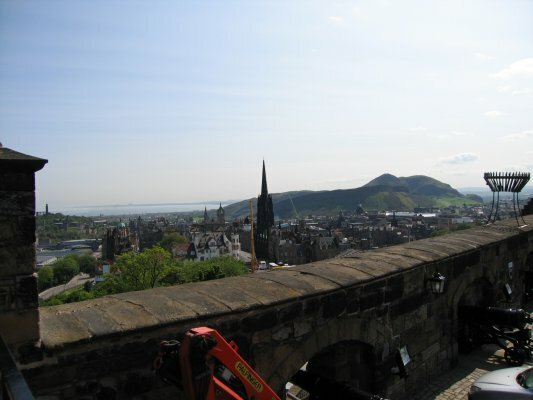 The third picture is looking toward's Princes Street and the New Town. 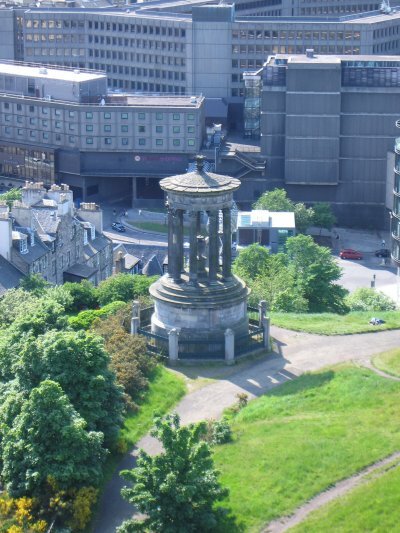 The monument in the picture is dedicated to Sir Walter Scott. 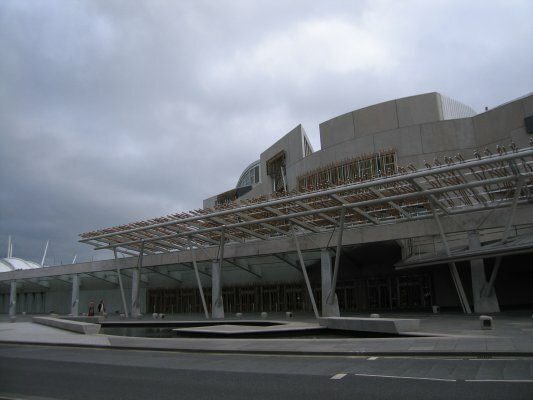 The interesting and very modern building in the first three pictures is the new Scottish Parliment buildig, just completed in 2004. 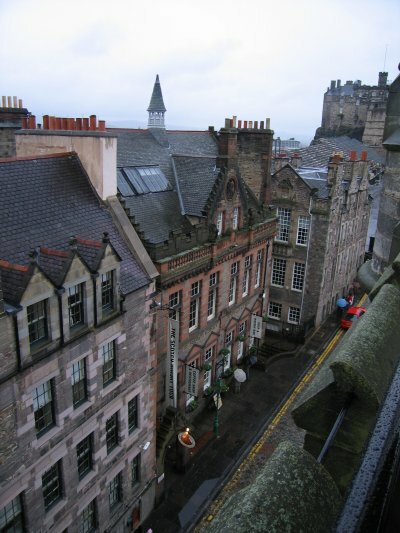 This building is at the opposite end of the Royal Mile from Edinburgh Castle. 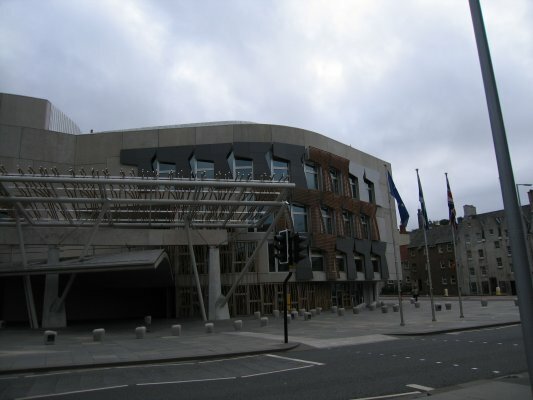 It is just before the Queens's Official residence in Scotland, Holyrood Palace. 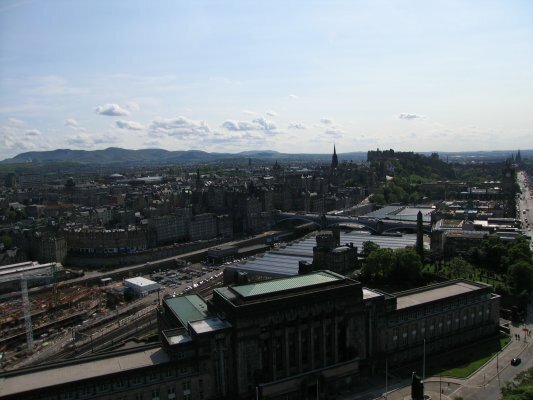 The fourth picture, with the sunny blue sky is looking towards Waverly Bridge. 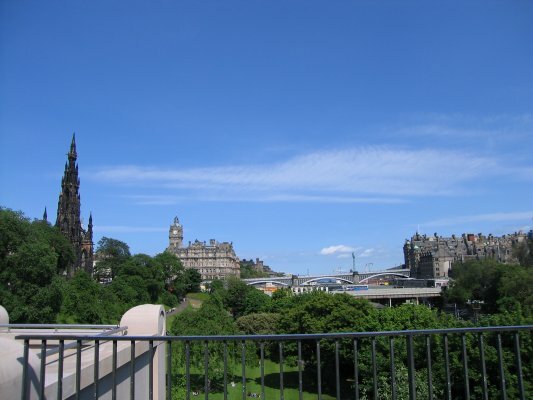 The Scott Monument is on the left. 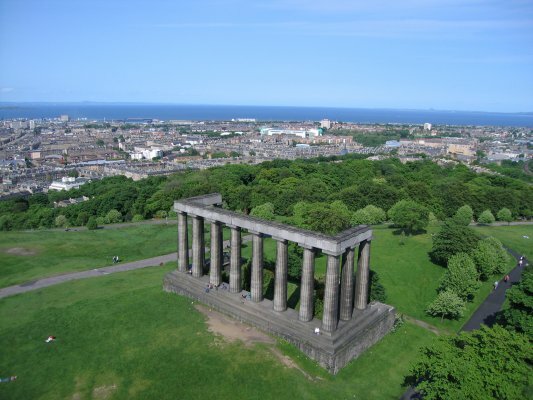 In addition to the Nelson Monument, a parthenon can be found. This war memorial was originally planned as a replica of the Parthenon in Athens, but the project ran out of money. WIth the blue sky and water you could almost imagine Greece in this photo. 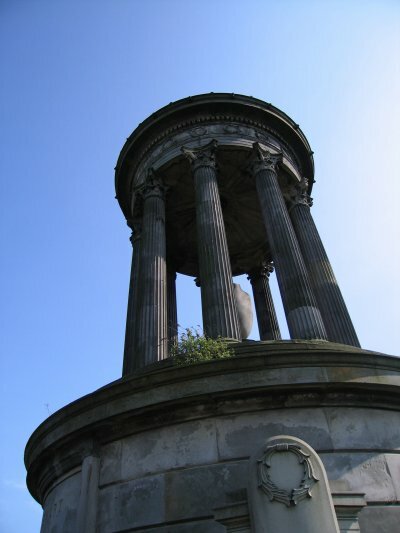 The second picture is of the city observatory and the next is a memorial, all built in a very neo-classical style. 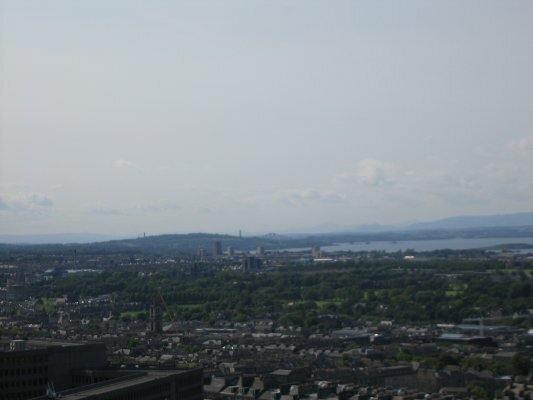 In the fourth picture, if you look very hard at the center, just above the horizon, you can see the famous bridge over the Firth of Forth. 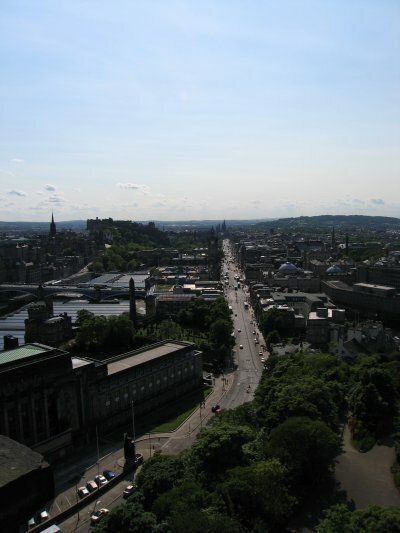 These first two photos are of Princes Street, looking towards Waverly Bridge, the train station, and the Castle. The third picture is a view slightly to the left, of the tracks and the old city. 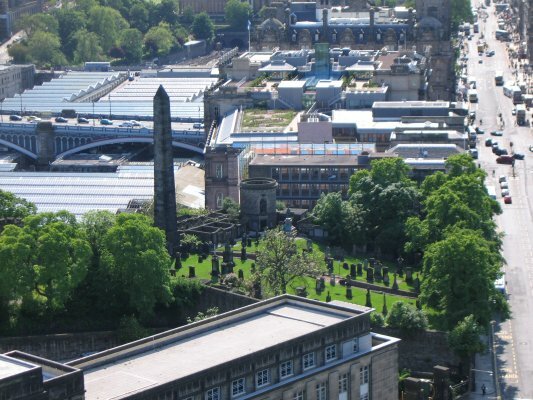 In the third picture, to the right of the obelisk you can see a round memorial to the Scottish philosopher David Hume. 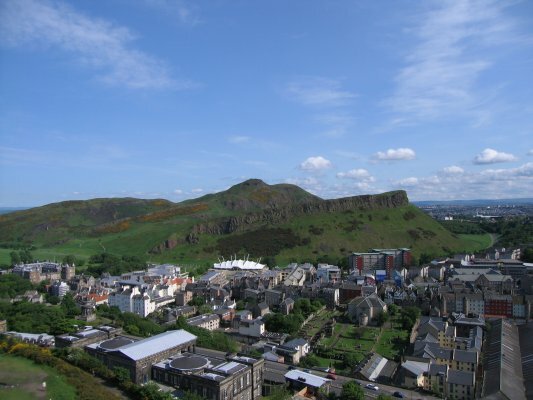 The fist picture is of the rise known as Arthur's Seat. 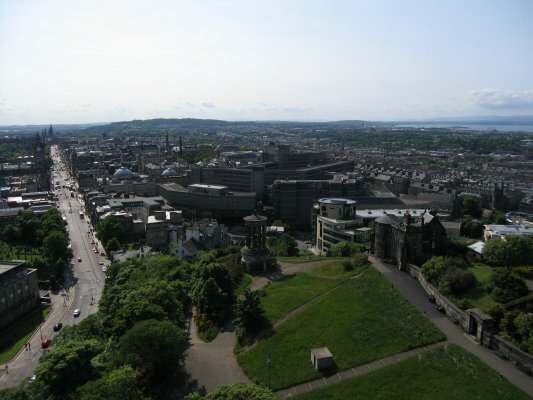 Towards the left side of the picture you can see Holyrood Palace and in the center (just below the thing that looks like a white football...don't know if it's connected) is the Parliment Building. On Tuesday we visited the Castle and saw the Scottish crown jewels and these two very different guns. The first is a late medieval cannon, known as 'Mons Meg'. The second is the 'One O Clock Gun' that is fired each day at 1300 hours. 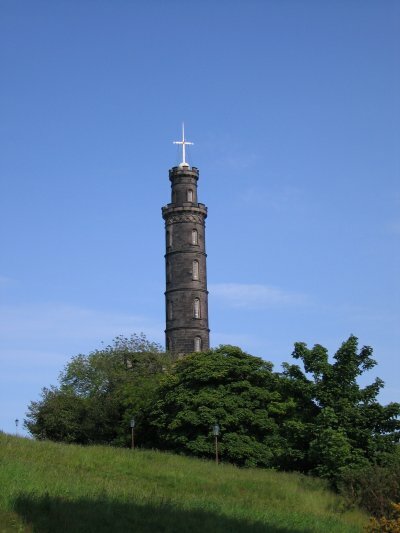 There is a timing ball on the top of the Nelson monument on Calton Hill that is lowered when the gun is fired. 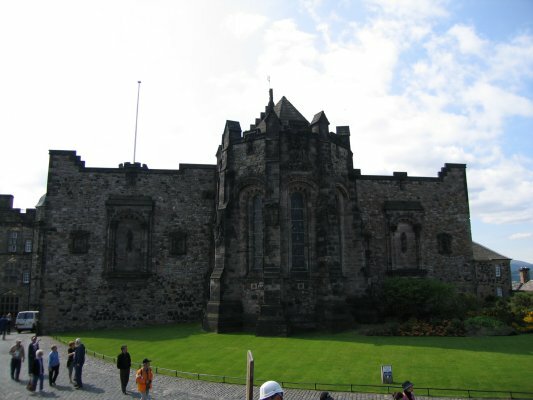 The first photo here is of the War Memorial chapel at the Castle. The next is a view from the castle. 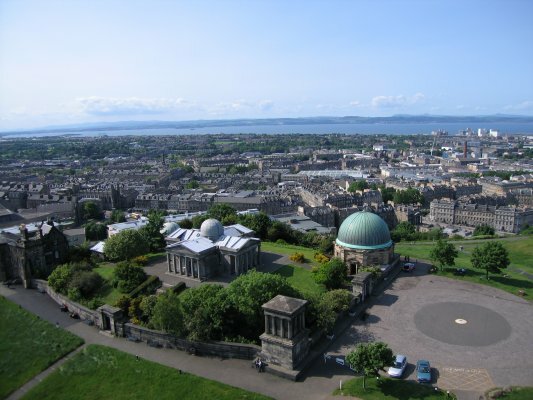 It's not the best photo, but it shows you the city: on the left you can see Calton Hill in the distance, then the sea, the funny rounded steeple in the center is St Giles, and Arthur's Seat is on the right. 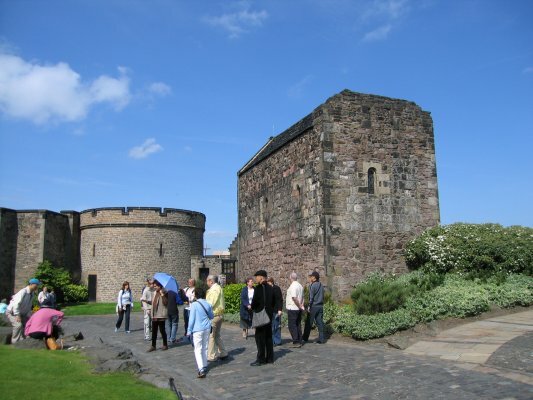 Lastly is a picture of St Margaret's Chapel, the oldest part of the Castle and the oldest building in Edinburgh.